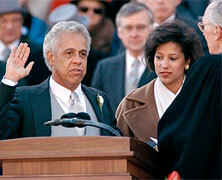 On this date in 1990, Lawrence Douglas Wilder of Virginia is inaugurated as the first Black to be elected governor in the United States. Wilder was elected in Virginia by a margin of approximately 7,00 votes (less than half of a percentage point). His victory was confirmed after a recount. He was sworn in by U.S. Supreme Court Justice Lewis F. Powell, Jr..
That Wilder was the first Black elected Governor in the history of the United States was novel enough, but that he was elected to Virginia, the Capital of the Confederacy made the victory even more significant. Wilder was presented the Spingarn Medal by the NAACP and served a full term, leaving office in 1994. Benjamin Hooks was born on this day in 1925 in Memphis, Tennessee. He was a Baptist minister and was a civil rights activist. He was a graduated of DePaul University School of Law, receiving a Juris Doctor in 1948. He passed the Bar in Tennessee and was one of the few Black lawyers in Memphis. He was ordained as a Baptist minister in 1956 and in 1965 was appointed to serve on the Shelby County Criminal Court, thus becoming the first Black criminal court judge in the history of Tennessee. He joined the Southern Christian Leadership Conference and would later serve as the executive director of the NAACP in November of 1976. He served in that capacity for for 15 years. Hooks died on April 15, 2010. Don Barksdale becomes first Black person to play in an NBA All-Star Game as a member of the Baltimore Bullets. Barksdale was an outstanding basketball player, having starred as a 6’6″ center at UCLA. He was named a consensus All-American after the 1947 season, becoming the first Black basketball player so honored. 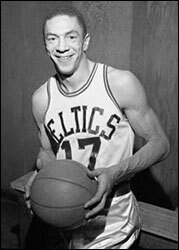 He was also the first Black basketball player selected to represent the United States in the Olympic games, playing in the 1948 games held in London, England. Barksdale died from throat cancer on March 8, 1993 in Oakland, California. He was elected to the Naismith Memorial Basketball Hall of Fame on February 24, 2012.